Remember that survey that we all went and took a week or two ago? Well now it is time for the second part of that survey the public open house. Alta Planning (who is using the $130,000 the Committee helped round up), is holding its first public involvement open house which, will be held at the Provo Library this Tuesday (11/29) from 4:30pm-7pm with important presentations at 5pm and 6pm. The idea for the big time spread is not to keep you in a meeting for three and a half hours, but to allow you to drop in and out as needed. As I mentioned last time this plan is going to be based largely on public feedback; this is to the point that the planners are going to be handing you a marker and a map and having you draw in where you would like to see bike lanes and facilities! Pretty much this is a one time opportunity. While Alta will hold more meetings which will be just as important as this one this meeting is a huge opportunity for all of us not only as riders but as citizens and community members in our wonderful little city to make a direct difference. Looking forward to seeing all of you there! How Do You Ride In The Winter? As a year round cyclist I get this question all the time, and it is a hard one to answer without having different types of gear present to make my case. Well, thanks to the Provo Collective that is no longer a problem. 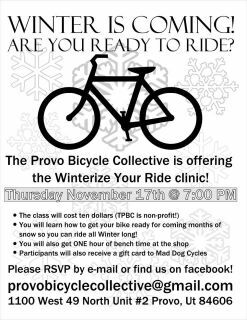 This Thursday the Collective is hosting a winterize your ride clinic. The clinic is going to include a show and tell of gear, a coupon to MadDog Cycles, and one hour of shop time that you can use any time during this season to work on/build up your ride. The shop time alone is worth the $10 they are asking for the clinic. So pull on a sweater and head over to the collective this Thursday, make it the first ride of your winter season! 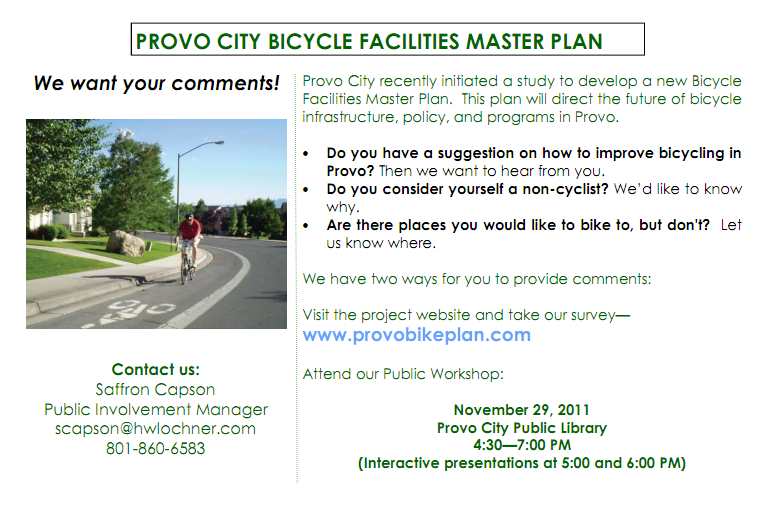 Take the survey here, and get bike lanes as well as money for bike lanes here in Provo. As many of you know from past posts Provo City and the Provo Bicycle Committee recently secured a $130,000 grant to establish a comprehensive bicycle plan for Provo. The plan will include not just lines on a map but, education policy for riders and drivers, priority list of projects to be done, as well as 5 years of funding for lane implementation. This plan is a big deal and has buy in not only from Provo but also UTA, and UDOT, which will be great partners in making our system of trails and lanes safe and complete. The project now has a website (which can be found here), and a survey (found here), that all of us need to go fill out. This plan is going to be fully based on public involvement so we have to have feedback from everyone. It will only take a minute and will make a huge difference. Once you have taken a minute to head over and take the survey make sure to forward a link on to friends or, better yet post it on your Facebook/social media. Don’t Forget to Vote in the Provo Election Tomorrow! Tomorrow, November 8, is election day for Provo. Whatever district you live in, you have the chance to vote for bike-friendly Provo city council candidates (see this guide) who will help make the streets safer for riding and walking. Everyone can vote in the city-wide race. If you live in one of the districts with an area-specific election, you can also vote in that race. Your vote will make a huge difference for Provo. 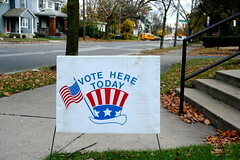 Please make sure to cast your ballot tomorrow and remind your friends and family members to vote too! 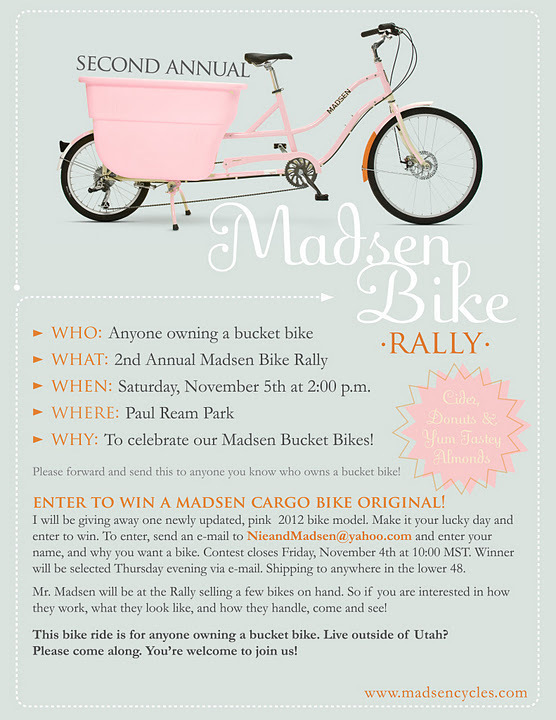 This Saturday (November 5), local blogger NieNie will be hosting the Second Annual Madsen Bike Rally for anyone that rides one of those beautiful bucket bikes or wants to test one out. Take a look at the details below and check out her blog for more information. The symposium will feature speakers from the local government, as well as local businesses and agencies concerned with transportation in Salt Lake and Utah Valleys.